I would like to commend your ambulance service and two of your staff members for extraordinary service and care that I received on November 16, 2007. After having my wife drive me to the hospital in Templeton for chest pains it was immediately determined that I was suffering a heart attack. The doctors in the emergency room determined that I needed to get to Sierra Vista Hospital for additional treatment as soon as possible. Your Paramedic unit out of Templeton was called to provide the transportation to Sierra Vista. Upon the arrival of the paramedics they immediately took charge of the transportation process and at the same time explained to my wife that she should go on to Sierra Vista as they would probably pass her enroute. I was transferred from the emergency room into the Paramedic unit and all of the equipment had been adjusted for the trip. At this time, I felt comfortable and VERY confident that I was in good hands. The next thing I recall are my eyes opening and looking at the large group of people at the rear of the ambulance and saying “we’re there already?” Much to my shock, I was told by the Paramedic that my heart had stopped and CPR had been administered. I was then taken back into the emergency room, stabilized and then transferred to Sierra Vista to have a clot removed from my heart. 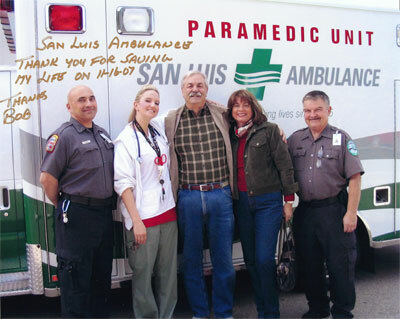 It’s very plain and simple that Paramedics Brian B. and Jerry P., along with nurse Diane E., saved my life. I will be grateful to your company and great staff members for their commitment to emergency services and for saving my life. Please pass on my gratitude to Brian and Jerry.